Eat protein and ditch the carbohydrates. Eat what you like for five days and fast for two. Live on grapefruit alone. Or cabbage soup. So many of us have tried innumerable diets over the years, and they all suffer from one fundamental flaw: They require willpower. What if you could tweak the settings of your brain to always resist temptation? In a recent study, a group of male volunteers, given a dose of mild electrical stimulation to their brains for 20 minutes every day, consumed less food after a week. Quite a bit less. After a week, their caloric intake was reduced by 14 percent. It’s a response that surprised even the researchers. “I didn’t think the reduction in calorie intake would be so much,” says Kerstin Oltmanns, who was involved with the research carried out at the University of Lübeck in Germany. The technique, transcranial direct current stimulation (tDCS), delivered a low, painless current to a specific region of the students’ brains, their dorsolateral prefrontal cortex—an area on the brain’s outer surface at the front of the head. The students were told they were taking part in research into the effects of tDCS on mood and were given a buffet at the end of the weeklong session as a thank-you for their efforts. They were unaware that the number of calories they consumed was being monitored. In this study, the subjects were all of healthy weight, but the “next step is to explore whether it also works with obese people,” says Oltmanns. 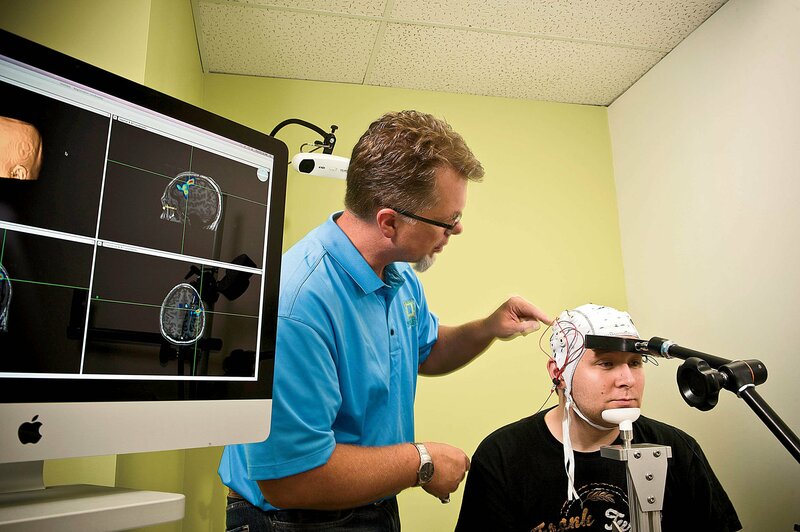 The basic principle behind tDCS is fairly straightforward. After an electrical current makes its way through the scalp, it affects the brain region beneath. The current is too small to make the nerve cells, the neurons, fire. But it does put them in an altered physiological state, making them more or less likely to fire, depending on the type of stimulation given. What’s harder to fathom is the exact mechanism by which brain stimulation reduced the students’ calorie intake. In this study, the subjects reported that their appetites had dropped, and Oltmanns believes tDCS might have had something to do with it. A different piece of yet to be published research suggests that the slimming effects of brain stimulation are really about the fact that it increases our willpower—our ability to resist temptation—and not so much about suppressing appetite specifically. In the research, which will soon be published in the journal Appetite, female students in Brazil had the electrical activity measured inside their brains using an electroencephalogram while looking at food after a 20-minute dose of tDCS and after a “sham” dose, when the electrodes were fitted to their heads but no brain stimulation was given. Just as in Oltmanns’s study, when the tDCS gear was switched on, the dorsolateral prefrontal cortex was stimulated and the subjects ended up eating less. But this time, researchers noted an interesting pattern of electrical activity inside the subjects’ heads. When they first glanced at the food and their brains had been stimulated, there was less activity, compared with when there was no stimulation, indicating fewer brain cells were firing. Then—just milliseconds later—there was suddenly a flurry of activity in their stimulated brains, showing significantly more brain cells were firing. Felipe Fregni, an associate professor at Harvard Medical School who was involved with the research, has a theory on why that happened. “The students ingested fewer calories because they could make more rational decisions,” he says. He says tDCS may have dialed up the activity in the students’ prefrontal cortices—where the stimulation was applied and where they make rational, considered decisions, which in turn dialed down the students’ initial knee-jerk reaction to eat food when they saw it. This makes good sense: The dorsolateral prefrontal cortex is known to be an area of the brain that enables us to inhibit temptation. Cohen Kadosh has been investigating whether tDCS can boost people’s mathematical abilities when delivered to another brain region, the parietal lobe. It seems it does. Over the past decade or so, there’s been a surge in interest in brain stimulation research at universities around the world. Some studies show it might help stroke patients recover, and others show it will help fighter pilots stay awake and focused over long periods. One scientist, Allan Snyder at the University of Sydney in Australia, has ambitions of developing a “thinking cap” that uses tDCS to boost creative thinking. There’s early evidence that this may be the case. In one of Cohen Kadosh’s studies, while brain stimulation increased volunteers’ abilities to memorize a list of made-up symbols that represented various numbers (e.g., a clover equaled 8, a heart equaled 3), they were less able to process these digits—use them in another task—than volunteers who had attempted to memorize them “naturally,” without brain stimulation. TDCS devices utilize very simple technology, and a capable do-it-yourselfer with a soldering iron could put one together with less than $20 worth of materials bought at the local RadioShack. But Cohen Kadosh and other tDCS researchers warn that at-home use isn’t advisable. In other words, it may be a while before we start using brain stimulation to get slimmer. There would, after all, need to be a host of clinical trials before it’s sanctioned as an official treatment. (There is certainly movement in that direction: The Food and Drug Administration is now recruiting participants for a trial.) In the meanwhile, your best bet is to simply back away from that cookie.